(10-19-2017 09:36 AM)pickedPocket Wrote: Might I recommend Axekind as a replacement? Dragons are a big animal and there are a lot of different weapons you can model after them. In this case Axes = Wings. While I appreciate the idea, it wouldn't seem right. He isn't a berserker. He's a strategist. Therefore he needs a light weapon that would be fast at attacking. Something like a scythe. Name: Azhaka Ddraig. His first name is a hybrid of the ancient dragon Azi Dahaka from Avestan mythology, while his last name is that of Y Ddraig Goch, the welsh dragon prophesized to be the destroyer of the English. credit to the person who drew the hair attached to body. anything else was my design. Gender: Male, although he is mistaken for female with his hair being so long. Blood/Typing/Symbol/Shirt Decal Colour: blue. He hides the true color of his blood by wearing the color black on a white hoodie. Symbol/Shirt Decal: The Ansuz rune. Like you said, it means god and can also mean knowledge. mainly for him, it stands for god of knowledge, due to the chance of him god-tiering as his abilities grow. Horns: straight Y shapes just above his eyes, heading back into an angle. Lusus/Guardian: the dragon his last name's based off of, Y Ddraig Goch. Strife Specibus: Ocarinakind and tomekind. Tomekind has a knowledgeable amount of content in it, roughly about as the unabridged version of Sassacre's. Ocarinakind to get his items out of inventory. yyrites In a eccentric waYy. basically he changes anything that looks like a Y or sounds like Y to a Y. [PMD]: Alryght. Can anYy of Yyou understand yyhat is gonna happyn? No? yyell, GET THYS. [PMD]: One of Yyou fuckers are apparyntly goyng to stab mYy back. [PMD]: I'm pyssed, so figure who yt ys bYy Yyourself. [PMD]: It's more fun thys waYy. Ancestor: Yedrig Ddraig, more known as The Anti-Hero - somebody who was once a hero and caught killing another troll who did nothing of the sort. Before we contine with The Anti-Hero, let's symbolize his name. Yedrig is a kind of play-on-words of Yggdrasil, the ancient tree that connects the Nine Realms with life and energy. Back to backstory. The Anti-Hero was once The Hero, capable of cutting down even the toughest enemies and had an infinite amount of knowledge. He kept his thoughts and discoveries inside journals that documented what were happening around him. This part is where it gets hazy and mulled over, as there wasn't a witness to document. The Hero had a doppelganger running around causing havoc. 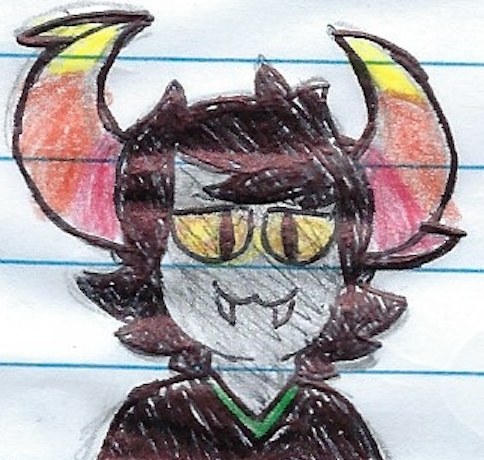 He'd encountered the troll several times, even told him to stop -although he kept on doing it like he was caliborn - that's when he flipped and argily went on a wordy rant, triggering everything oh my god no, why do you do this, I have clam up vantas. and everyone around him. Therefore, the kid went up to someone with a scythe and killed him. The kid got away with it, The Hero Escaped Executioner Darkleer by hiding in shadows, became the Anti-Hero and joined the revolution, hell-bent on finding this person and killing them. Two years pass. The Executioner finally catches up with him. The troll watches in the shadows as The Executioner drags The Anti-Hero towards the Condescension. BasycallYy, he nearlYy dyes and escapes to a mountain and yyas never seen agayn. Somehow, somebodYy found hym, revealed hyrself to be hys matesprit. end yf storYy. Story/Background and Personality: Azhaka isn't really much of a cheery person. In fact, he's a rather distant and off-putting troll, who lives in a mountain. literally. He's also rather stoic, preferring to hide his emotions. As for his background, he was born and raised for three sweeps alone with no lusus. After the third sweep, he came across an abandoned lusus, and took it in his giant mountain cave. Bada bing bada boom, Azhaka. No information otherwise. When Azhaka was a small wriggler, around 1 sweep, he was crying all the time for nothing and everything. Nobody was his moirail and everyone pushed him away. That pushed him over the edge, somewhat mentally. He spoke to nobody -albeit they were there with him- and is distraught in more important matters. He in a sense became Kurloz, without the stitching and facepaint/faygo combo. But then at 5 sweeps old, a person who walked beside him everyday, no matter where he was going. She became his moirail, but never gave him her name. Only her trolltag. Another sweep, just before his birthday. Somebody controlled him to stab himself in the eye. He sewed it shut, still not painless to this day. LOTAS is one of the most difficult planets to ever be on, mostly due to its dark and hot climate. it constantly seems to be purple, one of the feared bloodcolors, as for sand, it's because he fears that his knowledge on sand is limited and weak in general. He never actually encountered sand in his life. Denizen: Věri Şělen, a "fire Dragon" of Chuvash origin. [/font] ok. Here goes nothing. Her hive is by a black beach for one specific hobby: making stained glass. Since black sand makes a perfect red color, she lives by the beach. The area also has some underwater caves and land ones, also containing stained glass materials. This is also why her hive is decorated with stained glass. A lot of it. Being raised by snakemom, snakemom was actually quite affectionate. This is due to the fact snakes will guard eggs until they hatch (I watch way too much National Geographic.) In her teachings with her lusus have learned to be cunning and decisive through methods of spying to being a excellent stealer (she really wonders why her lusus taught her that, since she usually has everything she generally needs) but uses the skill anyway in swiping troll’s shoes as practice. It’s kind of why you also see shoes scattered in areas here or tjere around her hive. Since she is the Slyph of Void, she is extremely secretive to a whole new level. Emotions. Actions. Words. She lies so well it looks completely genuine or avoids telling you anything entirely. It’s like a lying addiction. She lies about who she loves. (Spoiler Alert: it’s a rustblood who’s character isn’t really developed yet) she lies about what she thinks of others. Secretive about it. > --Rejoice because the RP you posted has gotten 11 out of it's 12 needed players! Huzzah! Admittedly though; when I think of a scythe, I get the impression of a farm-hand; someone from a lesser blood-caste who's using equipment that they'd typically be used to in day-to-day life. Perhaps a polearm of some different sort could be used? A poleaxe for instance, if you wanted to incorporate something of the draconic element? "Eternity eludes us, even as a thought." (10-20-2017 07:44 AM)XenmusHykrus Wrote: While I appreciate the idea, it wouldn't seem right. He isn't a berserker. He's a strategist. Therefore he needs a light weapon that would be fast at attacking. Something like a scythe. Lusus: A humongous three-eyed python-like creature called a slithershedder.